Nick Clegg has shunned talk of deals with other parties in a keynote conference speech and instead told Lib Dems: "I want to be prime minister." The Lib Dem leader was bidding to reassert his authority after a bruising week - and reach out to disaffected Labour voters thinking of voting Tory. In his speech he urged voters not to sleepwalk into a Tory government and opt for "real change" instead. The Lib Dems say their private polling shows the next election is "wide open". Mr Clegg spoke without notes for just under 50 minutes - and his speech was greeted with a standing ovation from delegates in the Bournemouth centre, which included wife Miriam and former party leaders Lord Ashdown and Sir Menzies Campbell in the front row. The speech was also watched by a group of Gurkhas, who received a round of applause after Mr Clegg said he was "honoured" they could be present. 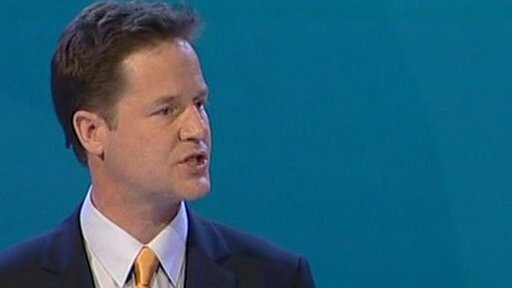 Mr Clegg deliberately chose not to talk about what might happen in the event of a hung Parliament, focusing instead on what a Liberal Democrat government would do. He stressed the party's commitment to fairer taxation and vowed to "clean up" Westminster politics including MPs' expenses. And he said young people were his party's top priority - and proposed a 90 day job or training guarantee for the young unemployed, paid for by scrapping Labour's VAT cut. He said: "Labour is dying on its feet. We are replacing them as the dominant force of progressive politics. We are the alternative to a hollow Conservative Party that offers just an illusion of change." He began the speech by hardening his line on Afghanistan - saying there was "one more chance to turn things around". "I know some of you believe we should call for British troops to withdraw now," he told delegates. "If things continue on the present disastrous course, then sooner or later that is a judgement which we may need to make." But there was no mention of dropping a pledge to scrap university tuition fees from the next manifesto - a suggestion which sparked open warfare in the party at the start of the week. He briefly mentioned Vince Cable's £1m "mansion tax" in a section on rebalancing the tax system so that the wealthy pay more. The 0.5% levy on owners of £1m-plus homes sparked a backlash from some of the party's senior MPs earlier in the week, prompting an admission from the Treasury spokesman that he could have consulted more widely before announcing it. Mr Clegg also addressed criticism from former leader Charles Kennedy, who said the party was in danger of losing its "heart" with Mr Clegg's talk of the need for "savage" spending cuts to tackle Britain's record debts. Unlike Labour and the Tories, the Lib Dems had "come clean" about what cuts were needed and were guided by principles of "fairness", he said. "Not just austerity, but progressive austerity. Reducing the deficit, yes, but also building a fair society and a green economy. "Still driven by generosity of spirit, but fit for the circumstances of the day. It's the only way to deliver real change in Britain." He spoke at length about what Britain would be like if the Lib Dems were in power, in what aides described beforehand as the most ambitious speech ever given by a leader of their party. "I want to be prime minister because I have spent half my lifetime imagining a better society. And I want to spend the next half making it happen," he told the party faithful. Mr Clegg ended by delivering a message to voters who do not usually vote Lib Dem or have given up voting altogether, telling them: "Don't stay at home, don't vote Conservative just because you think it's the only option." He said: "If you supported Labour in 1997 because you wanted fairness, you wanted young people to flourish, you wanted political reform, you wanted the environment protected, or you simply believed in a better future, turn to the Liberal Democrats. "I know there are people who agree with a lot of what we've got to say, but who still don't vote Liberal Democrat. You don't think we're contenders. I urge you to think again." Mr Clegg's predecessor as party leader Sir Menzies Campbell hailed the speech as "an extremely impressive performance" which showed Mr Clegg was "ambitious for the party and the country". He said the speech was "uncompromising" in spelling out the difficult decisions that needed to be taken and it showed Mr Clegg was "leading from the front". He compared Mr Clegg's call for change to US President Barack Obama's message. But Conservative Party chairman Eric Pickles, giving his reaction to the speech, said:"Nick Clegg says he wants to be prime minister but I listened to his speech and still can't discover a reason for voters to choose him over David Cameron. "After this muddled conference, it's now clearer than ever that if you want to get rid of Gordon Brown and his big brother state, and if you care about our schools, our quality of life and our liberties, you need to vote Conservative for a progressive, liberal government."